After 62 years, 600 meetings and more than a dozen elections, Britain’s longest serving councillor is preparing to leave Peterborough’s council chamber for the final time. Cllr Charles Swift was first elected as councillor by the people of the north ward in Peterborough in 1954 - and has been their representative in Peterborough Town Hall ever since, becoming the country’s longest serving councillor in the process. His last election win was in May last year, when he was voted in to serve a three year term. But, next month he will enter the council chamber for the final time as a ward councillor, after announcing he will not stand for election in May. He would have had to stand again because of a change in the way the Peterborough City Council elections are run. The announcement comes just a few weeks before his 86th birthday, and he said it had been a difficult decision. He said: “I will be 86 in a few weeks time, and will have been married for 60 years. I think it is time I called it a day. “People will still be able to come and see me, and my door will always be open. I have been knocking on doors since I was 16, so it has been a long time. “When I told people I was not standing this year, people could not understand it. During his time, he has overseen some of the biggest changes to Peterborough, including playing a key role in getting it designated as a New Town in 1967. And always one to help people, in 1972 Cllr Swift set aside 50 council houses in Peterborough for Ugandan refugees. Cllr Swift - who said he preferred to be called ‘Charlie’ rather than ‘councillor’ Swift, has one more full council meeting to attend, which will take place on March 9. He said: “I have been to more than 600 council meetings in my time, and I have only missed two - and they were missed because I was on council business abroad. “I have been to 62 mayor making ceremonies, and was lucky enough to be mayor in 1961, when I was the youngest ever mayor - a record I still hold - aged 30. “My mother (Maud) was a councillor when I was mayor, and in council meetings I was able to tell my mother to be quiet and to sit down. 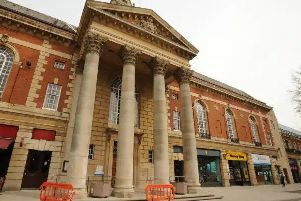 “My sister (Audrey Chalmers), has also been a councillor during my time here, so it will be sad there will not be a Swift in the town hall now. “My last meeting will be in March, and I know I will have a tear in my eye at the end. I will try and put on a brave face, but there is bound to be a tear. It is like severing an artery, I have been here so long. “I will miss the officers, who have always been good to me. Cllr Swift was awarded the OBE in 1985 for his services to the public. In 2014 his wife, Brenda, was awarded the freedom of the city, 31 years after he was given the same honour. However, despite the countless hours he has spent debating in the chamber, he said he had no intention of returning to see his successor and his colleagues discuss the direction of the city. He said: “I think that when the lads who go to court get a suspended sentence and community work if they got sent to see council meetings, they would never offend again. “It is like a pre-school with some of the debates. Now he has a bit more spare time, cllr swift is planning on seeing his family a bit more. He said:” I am writing a book, and I hope to get that completed soon. To celebrate Cllr Swift’s 62 year career at Peterborough City Council, a special event will take place where residents can hear some of the stories of his time. An Evening With Councillor Charles Swift will take place on at 7.30pm Friday, April 15 at the Salvation Army Citadel at The Triangle, Lincoln Road. Cllr Swift said he was sure the evening would be popular with people wanting to hear the inside story on his time. He said: “I am hoping we will get a good audience to come along and attend the event. “There are a number of stories which I have kept secret through my time here which I will be telling on the night for the very first time. “I am sure it will be an event a lot of people will not want to miss. Tickets for the event are currently available from The Mayor’s Office, costing £10. To book a place email mayorscharities@civicpeterborough.co.uk or call 07506 388 718.